Thanks to Lowe’s for their support and installation of the floors in this home improvement project! But first, I thought it would be fun to take a look back at what the staircase used to look like! Between the carpeted stairs and the swine walls, it wasn’t exactly my style. But, ever grateful for having a home, we lived with it that way as long as we could. I can’t even remember when we started this project, maybe two years ago? We’re speedy like that. We began the staircase makeover by priming the oak handrails and painting them black (since we could do that without a near death experience dangling over a staircase), followed by the stripes on the wall because I was dying for a little more character and personality at my house. Sorry for this hideous progress pic, but you can’t really appreciate how far things have come without seeing the swine walls, carpet, the black rails and the stripes. Remember how MUCH SWINE I had in this house? We are now down to just three rooms of swine. YAY FOR PROGRESS! The stairway at this point was all pretty awful together, I know, but I knew in the end it would all come together like I imagined it in my mind. But, we had to wait a very long time until we could afford to have someone come paint the two story “swine” walls in our entry. While it was frustrating only having part of our staircase done and having to live with the swine walls and carpet, that is how we roll around here. We do what we can, when we can do it. Even if it isn’t perfect or finished. Finally our entry walls were painted, I was so happy to see the swine paint go! But, we still had the carpet that seemed to get yuckier by the day. We lived with it for what seemed like another eternity until this past week! Yahoo, good-bye carpet! Thanks to Lowe’s and their awesome team of installers, we now have new Hickory solid hardwood floors! I LOVE LOVE LOVE them! I really want our house to be the kind of place you could walk in with sandy feet and feel comfortable, like an informal but still a bit classy old beach house. 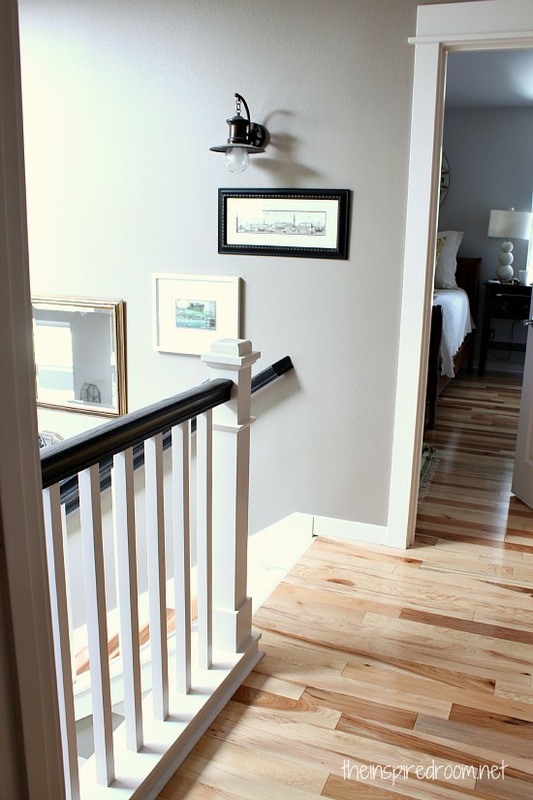 The Hickory has a ton of character, is absolutely beautiful to look at and such low maintenance! That is a win-win-win for me! The floors really set the stage for what I want the house to be like, so I’m beyond thrilled with how things are coming along. I did not want to deal with painting or staining the stairs while living here with kids and dogs and a kitchen remodel going on at the same time, so I love that the treads (and floors!) were installed pre-finished so we could walk on them same day. The risers are primed white but not yet painted, but fortunately that is a project we can do over time. We will be painting all the white parts of the staircase with a fresh coat of white paint (right now it is a bit pinkish). Big job, but nothing is ever simple, is it? Here you can see a little bit of the wood floors from the upstairs hallway! The top two steps are not done yet (all the risers did not arrive), but should be finished up soon. The flooring is all done though and the quarter rounds were installed around all of the baseboards. The bedroom looks awesome with hardwoods and new paint, even though the room isn’t all fixed up yet. It feels so fresh and pretty, I can’t stop looking at it! I actually ordered new curtains this week so maybe I’ll make a little more progress and give you the progress report on that room next week, so you can get all the paint color details too. I’m really looking forward to seeing the before pictures and the progress pics too! I cannot even tell you how thrilled I am every day to walk upstairs and see this hallway with the lovely hardwood floors. They really transformed everything. My whole house feels different, lighter, brighter, cleaner and much closer to the image I have of it in my mind! They add so much life and personality to the house! The carpet didn’t do anything at all for the style I had in mind so I feel extremely blessed to finally have hardwood floors here. And, honestly, I’m glad I had to wait three and a half years for what I wanted. I learned patience and was able to really think through my style before committing to anything. Lots more to do around our house, of course, but we’ve made some major strides ahead! I’ll have plenty more updates on the wood floors in the living room and dining room (cannot wait to see how those rooms are transformed! ), as well as the kitchen remodeling project and progress in the days and weeks to come! Thanks, everyone, for coming along with me on this journey to transform my house. It is so much more fun to have you all to share this with cause I know you all “get” how exciting this is for me! 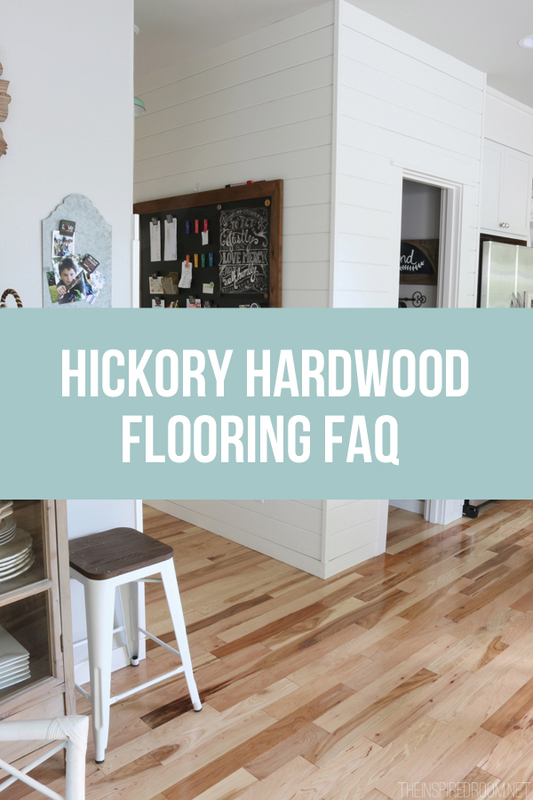 For my FAQ about my Hickory floors, click here! Thanks again to Lowe’s for partnering with me on this project so I could make my wood floor dreams come true! My kitchen contractor walked in our house after the floors were done and said they were amazing and that Lowe’s had done a fabulous job with the install too. Contractors don’t always speak highly of other contractors work, so I was thrilled that he noticed how beautiful my floors were! 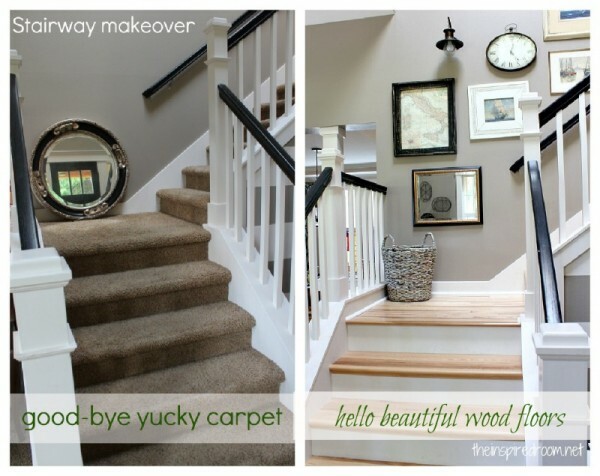 First, your home is beautiful and I agree with you, the hard wood floors are beautiful!!! What a new, fresh look! Very happy for you and look forward to more improvements! I agree, and thanks so much! Amazing! Love it all. Can’t wait to see the rest of the make over. Wow! They are beautiful, I love the character in the wood! This is what I would it I had the money. Oh my goodness I have been wanting to do something different to my staircase, it is white with oak, and I 12 years after oak was in now, I am so tired of it, I love the idea of black and white…very cool! Love the floors! Definitely a fantastic upgrade! It looks amazing. Bright and cheery, casually elegant (if that’s even possible), definitely a very good decision. So happy for you and your family! I get the excitement…I have the same excitement here knowing my new floors are just a month or so away…I am waiting until September – but in the meantime, thanks for sharing yours!!! I am so excited for you – seeing your light floors is making me rethink which floors I should go with, was originally think dark wood floors…but I am really liking yours! Ha well dark is nice too, but after living with dark so long in my old house I was ready for a fresh and light new look! I love it, they are very fun :-) if floors can be “fun”! I can just feel your excitement. I love when I’ve had to wait and wait for something and then the time comes. It really does give you a whole new level of appreciation doesn’t it. I love your gallery wall on the lovely soft gray walls with the wood stairs. It looks so pretty. Hi Melissa your new wood floor looks great! I just love wood flooring. It’s amazing what a difference it can make. I see why you’re so pleased!! Warm and charming look, well done. Floors are GORGEOUS! How exciting this process must be for you and your family! I would love to know how Jack negotiates those slick new stair treads. We’ve been afraid to put wooden stairs in the house because our dog might slip and slide. Have you got any ideas about how to solve that? Everything’s looking great! He isn’t really free to run up and down, at least yet. We take him up and down on his leash until he is a little less prone to running :-). But they really aren’t very slippery. Beautiful! We have green tinged carpet on our foyer staircase and all throughout the upstairs. I’d really love to get rid of it, but it seems like that could never happen. Thanks for sharing your experience and encouraging me to continue to be patient! The stairs and flooring looks beautiful, Melissa!!! I love how you are achieving your house goals one step at a time, with patience and the big picture in mind. Your perseverance has paid off! I LOVE how the stairs came out, and how you styled the wall. So welcoming and fresh to walk into! Really beautiful. It’s a great transformation. You had me laughing when you said that it has been going on for two years and you’re speedy like that. I’m still chuckling at that statement. Wow, it’s really pretty and such an improvement from the “swine wall” and beige carpet look the previous owners had embraced. Congratulations. It’s so exciting to see the transformation of your stairs and flooring since we are in the middle of ours also! There is light at the end of the tunnel!! I love how everything turned out! Our stairs are about half finished and the flooring goes in next week! Wow!! Melissa, everything looks so beautiful! I love the way you’ve decorated the stairwell, the clock & lantern look so nice with the other framed work! The floors look AMAZING! Congrats! Oh, girl!!!!!!!!! It looks stunning! Oh My Word!! I LOVE the wood and the new paint! WELL DONE! Your gallery wall looks great too! It is amazing how changing flooring or paint can change the way a room lives. I love your floors and am so happy for you. I love the prominent grain in the flooring. Lovely! Stunning! Your after photo is magazine-worth to be sure. I kept scrolling back up to it to study every perfectly placed detail! Oh my gosh, Melissa. Love. Love. Love. ♥♥♥ Those floors are gorgeous. 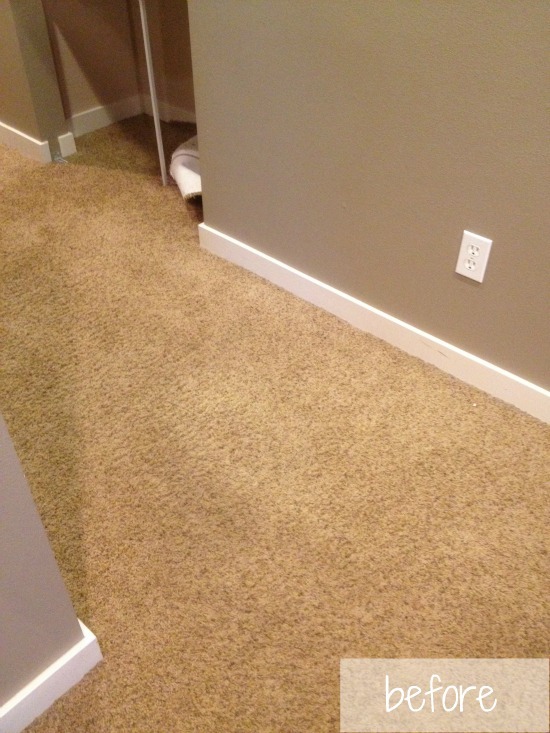 “Clean.” That word that makes me swoon and your anti-carpet floors do, indeed, embody that very thing. Yes, of course they look (insert admiring word here), but–Oh, heart be still–I believe you when you say they feel clean as they look! I am in a rental and long for hardwood floors. You can find them in my city, but for any rent under $3000/mo. you mightn’t get a garage nor laundry–not even in the building–to go with those floors. I love your hickory floors, too and can see why you are so tickled. My friend has them in her kitchen and I’ve always admired them and they wear really well, too. I can relate to having to wait to remodel. My old house was a 1960s ranch and it had white carpeting and white/blue painted linoleum floors and I had 3 little boys. After not being able to get the floor clean, I heard from the former owner that she mopped it every day. No thanks! It was such a happy time when we put in walnut flooring through out the entire first floor. So I can totally relate! So happy for you! Enjoy! Wow, the hardwood really does transform the space! It looks really really good! I can totally understand your excitement. Oh my gosh it all looks fabulous! I’d love to see how your new floors hold up to a dog running around. I have two of them and my hardwood floor is 60+ years old so it’s hard to tell what they’ve done versus what time has done. The variations in the hickory are beautiful and make for a truly unique pattern no matter where you look. Congrats! Gorgeous! The wood color is very happy. Is there anything worse than vacuuming stairs, ugh? So how do the steps work? Are the steps premade and put in over the board that is there like a veneer or is the old board removed and the whole step is a new solid board with a finished edge? Jaw dropping. The completed stairway project is beautiful! I love your choice of sconces that fit right into the lovely framed art display on the bottom (especially) and the top too. Oh….and the stair treads and the floors are lovely too. They really do give the rooms life. Are your daughters collaborating with you in your decor. I’m thinking YES and how fun that must be. Again…sooooo happy for you and the blessing of these projects. Ok lady love it all…but really digging your assortment of of art/wall decor heading up the stairs….that is my next to do! I had to laugh at your comment about how you couldn’t stop looking at the changes made to your home. Whenever I change something…a table arrangement, a closet clean out, swapping out pillows in the breakfast nook, I keep going back to look and admire…over and over. I thought I was the only one who did this, so it makes me feel better to know I’m not alone in obsessing! 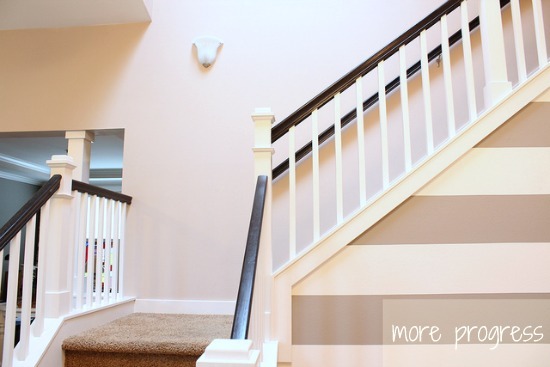 Great job…what’s your wall color on the stairs? It looks good with the black and white. I love the multi-tonal look and color variations! It looks fantastic! Your floors are wonderful! I love all the movement they provide. And, really, with pets how can you go wrong with a solid surface floor? One swipe of a dust mop and all fur is gone! Your staircase is beautiful. Thanks for sharing, and I’m looking forward to the rest of the house’s after pictures. The floor is awesome. We did something similar with our stairs and landing.Boy! I couldn’t wait to get rid of the nasty red carpet that was there. Your stairs now looks like a show house. Well done. Love it! wish we could have hardwood on our stairs, but pulling up the old carpet was such a disaster and some sort of glue on the stairs it didn’t work out. We do have hard wood floors in living room, hallway and bedrooms. Melissa, your floors look wonderful!! I’m so happy for you. And I love the way you say that you’re glad you had to wait for them. Isn’t it funny how often we say we wish we had patience, but then we don’t want to go through the experiences that would enable us to practice it? You go, girl! Awesome! I love it! The floors are so beautiful. The painting and decor alone makes a huge difference, but the new flooring on the stairs and in the hall are the coup de grace – Wow! Really gorgeous after! And having painted the stairs in my old townhouse several years ago, I can’t blame you for going pre-finished, walk on it the same day. Stepping over every other step for what seemed like years was rough on one person, can’t imagine it with a family and pets! Disaster recipe! wowzers, those floors are b-e-a-u-t-i-f-u-l, worth the wait!!! GORGEOUS…all of it! 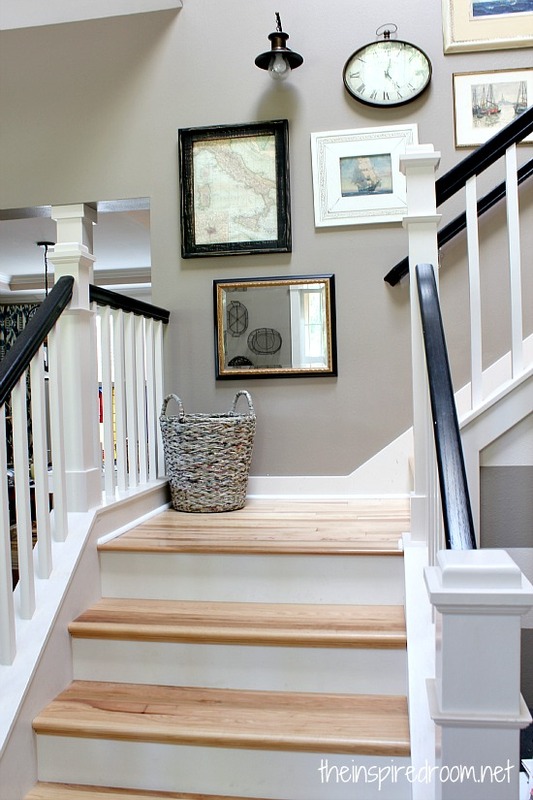 The floors, the paint color, and especially the gallery wall up the stairs look so good! Would love details on what you hung for the gallery wall…please? Sure, I’ll do a separate post on it for ya as soon as I can! Thanks so much! Love the new hardwood floor! Looks much better than the carpet :) Great makeover!! it really is absolutely beautiful…..so, so beautiful! Love Love Love the update. Am considering copying your black handrails. So beautiful and classic, yet updated! It all looks beautiful! Did I miss where you put the paint color? I would love to know it. Congratulations! I love the floors. I am planning on putting some hardwood floors in my future office and I heard hickory was pretty durable. The floors look wonderful. Aside from other great things, loving the wall arrangement up the stairs, especially the low hung mirror. The flooring is so gorgeous! It absolutely reminds me of something you would see in a beach house, and does so much for your space! love the staircase! beautiful. where did you get the wall sconces? Wayfair.com! They were really reasonable and great quality too, I love them! The glass is bubble glass! , but I am afraid of the reviews I have read online! Help!! I would also love to know please of the exact floors. Even a link, would be GREAT! Thanks! They are Mohawk Natural Hickory, prefinished! I’d really appreciate if you could email me too! I’ve been wanting those exact floors and wall color for ever now. I’d love to know the details if you wouldn’t mind sharing. 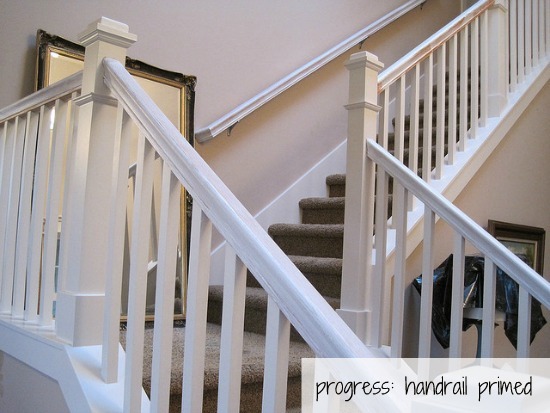 I’ve been wanting to paint or stain our oak handrails – did you sand them at all before you primed them? Leaning towards painting them if I can just prime & paint and skip the sanding step! I would also like to know did you sand the oak handrails before priming ? I adore your home and your decorating style, which is much like my own…. a little bit of everything and I LOVE it!! I’m in the process of repainting my entire home and my dining room, kitchen and living room are all one open space…. any suggestions for a great wall color? I have so many I like in the gray family, but just can’t decide. 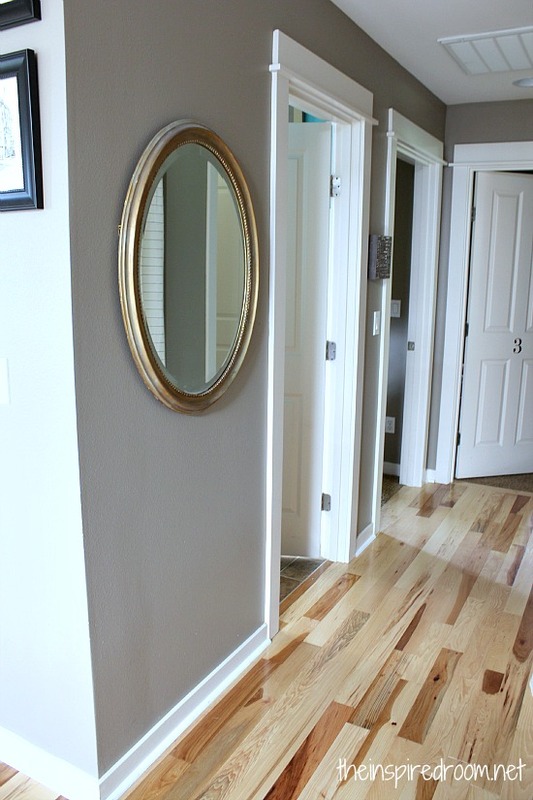 What color did you use in your hallway? Thanks so much for all your great info!! 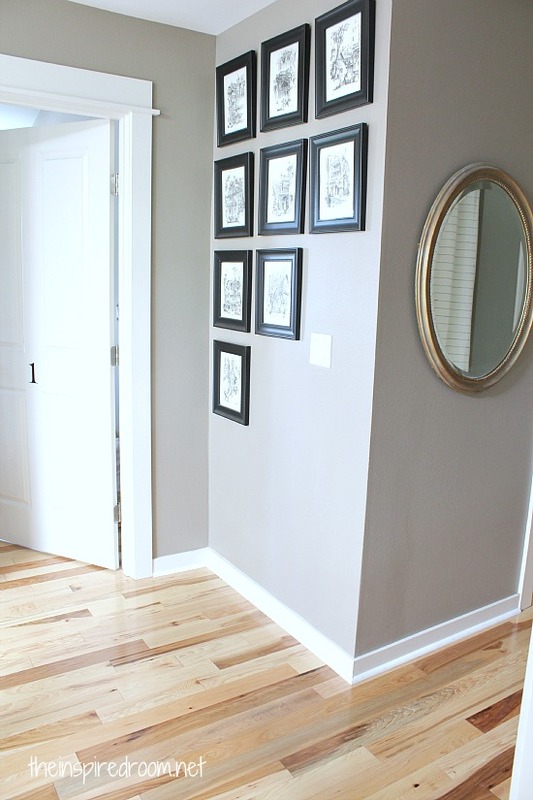 The paint in the hallway is studio taupe by behr! Good luck, and thanks for all the kind words and your comment! I love your home and the way you decorate. The floors are beautiful – someday I hope to do the same in my house. I really like the numbers on the bedroom doors. Are they vinyl or did you paint them on? Did you just number the bedrooms or all the doors upstairs? I’m painting my upstairs hallway and would like to do something similar on the doors. Hi Melissa! Your hardwood floors are beautiful. I love reading your blog.. my decor is the same as yours! I also live in Washington (Puyallup!).. I was wondering if you had any recommendations for a kitchen contractor! I am not even sure where to start when it comes to searching for someone to remodel our kitchen. I have so many ideas but I’m not sure what would even work in our house! If you know someone here in this area, I would appreciate any recommendations!!! Hi Melissa!! Long-time blog reader here, but I’m not much of a commenter. Your new flooring is absolutely, brilliantly beautiful. My husband and I are thinking of putting hickory down in our family room re-do. Would you mind telling us what width boards you used? We really like the look of yours. Thanks so much! Hi Heather! I am going to do a post soon here on more details on the wood to hopefully answer more questions on it. The boards are a 3 1/4″. They do come in a wider board but with small rooms like we have, that would have been overpowering. Thanks! Your house is gorgeous! What paint color is on the stairway? I have searched your blog and can’t seem to find it. Thank you! It’s called Studio Taupe by Behr. Melissa- I am just coming across your blog now, which is good timing. I too have had to wait 6 years to start working on major house projects. A little pain here and there, but now ready to dive in. It’s been a couple years, and would like to know how your wood floors have held up. 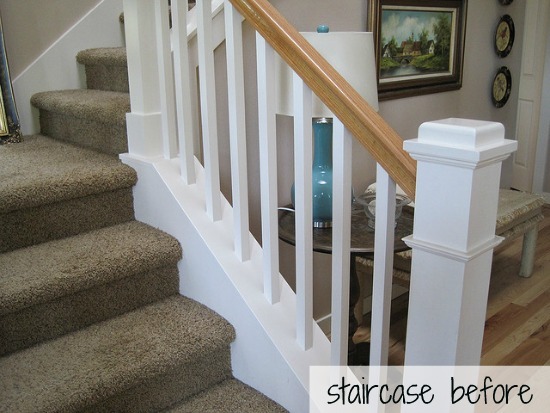 What kind of black paint and finish did you get to paint the stair case railing? Has it held up well? Love the transformation. We just bought hickory flooring ourselves. I was wondering what colour you used on the walls? What black paint did you use on the railing? 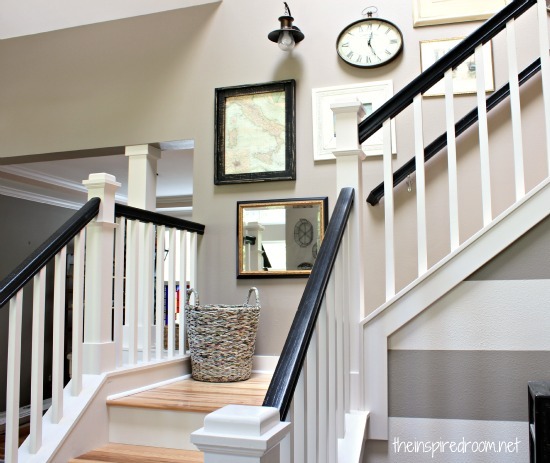 I NEED to know your paint color on the foyer/staircase walls. I love that is is neutral and fresh and even though it is grey, it is still warm and inviting! Looks great! What color paint is that gray? What color are your walls in these photos? It looks like these particular hardwoods have been discontinued; any suggestions on a similar alternative? Where did you find hickory wood for the stairs? I came across your blog on Pinterest and just love your style. Can you please share the white paint used on your stairs along with the black paint? I have been wanting to update my banister and stairs but can’t seem to settle on a black paint. Looking forward to hearing from you. We are considering putting hickory floors into our new build. I was wondering; what color paint did you pair with them? I really like it!